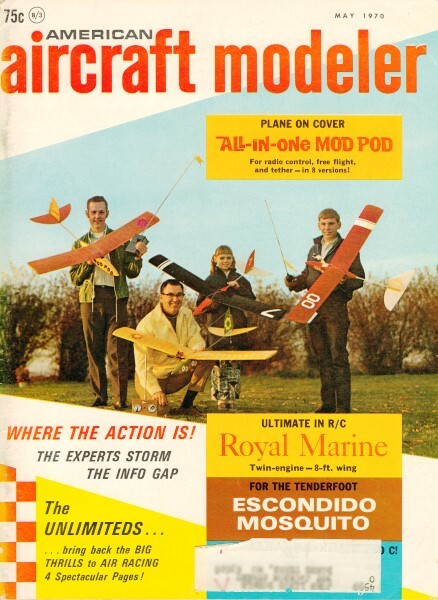 Airplanes and Rockets website visitor Jeff A. wrote to ask that I scan and post this constructions article for the Royal Marine twin-engine amphibious model from the May 1970 edition of American Aircraft Modeler. I was glad to oblige. The aircraft's designer, builder, and article's author, Mr. Yuji Oki does not exaggerate when he claims that the Royal Marine is "The world's most beautiful flying boat." Sure he might be a bit prejudiced in his assessment, but there's no denying the ship's attractiveness. Undertaking the building of this model is no yeoman's task, if I may appropriately borrow from seaman's terms. The plans are a work of art in themselves. Hopefully, Jeff will send a photo or two of his Royal Marine when he has it ready to fly. The world's most beautiful flying boat. Magnificent twin-40-powered seaplane by one of Japan's leading modelers is a fully stuntable graceful flyer which can handle all ROW conditions. Ready-to-fly at the OS Invitational Symposium at Lake Biwa, author at the controls. Most beautiful takeoffs are made starting with up-elevator to get on step, then let it fly off with just up-trim. Don't omit the spray rails. Install after fiber-glassing hull bottom. Use spruce shaped to triangular cross-section before mounting. Although bolted to wing, the pylon is to be removed from hull with wing for transporting. Use long leads from the servos to receiver. Important points inside hull are dowel holes and CamLocks for attaching pylon. Pre-dope all interior parts of hull before assembly. Generous dihedral in stab reduces spray problems during takeoff. Rudder is quite large, easily handles single-engine flight. Recently, R/C modelers have been driven away from flying sites for various reasons, usually building of factories and houses. Now we are almost forced o the foot-hills. As a matter of fact, I often visit hills nowdays and I find few flat, flying sites, but some lakes and good slopes. In this situation, I have tried to develop R/C hydroplanes and slope-soaring gliders. I want to introduce my twin-engined flying boat, which was flown very successfully at the OS Invitational Symposium at lake Biwa near Osaka last fall. Although the R/C hydroplane itself is not a novel subject for modelers, it is regarded as a difficult one to handle. The reason is supposed to be in the fact that the hydroplane has a problem of solving the adjustment on, or in, the water, in the air, and in between. We know of many cases that ignore one of these problems, rather than try to solve it. That is why some planes jump up in a VTO, making a steep climb without showing any beautiful planing. Some crawl on the water without an ability to conquer the "hump." Some fly unstably in the air because of the parasite drag caused by the floats or the hull of inadequate designs, etc. I have had an ardent wish to duplicate a beautiful, thrilling takeoff and landing, and a good performance in the air of a full-size flying boat into that of an R/C model. I did not avoid the problems of the two spheres (water and air) but tried to solve them. 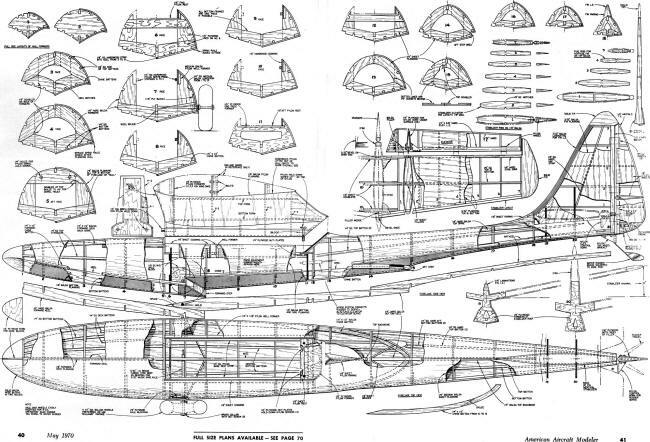 The flying boat in this article might not be the ideal, or the ultimate one. 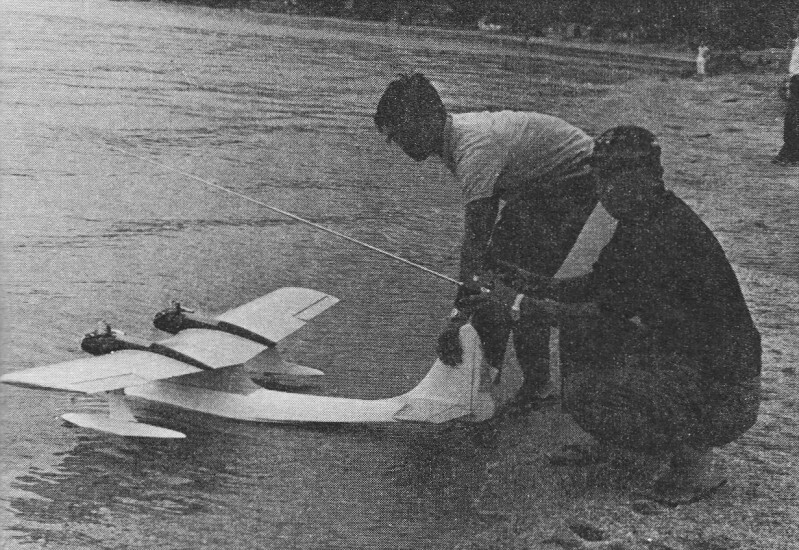 The study of R/C hydroplane must be continued in the future, but I have many witnesses prove the ability of this plane. Its purpose was to enjoy flying it and its appearance. The points considered in the basic study prior to designing were as follows: 1) Performances on the water and in the air; 2) A simple but strong structure in order to simplify maintenance when one is far from a work shop; 3) A beautiful appearance. I won't give how-to-build details, but will comment on design and structure. 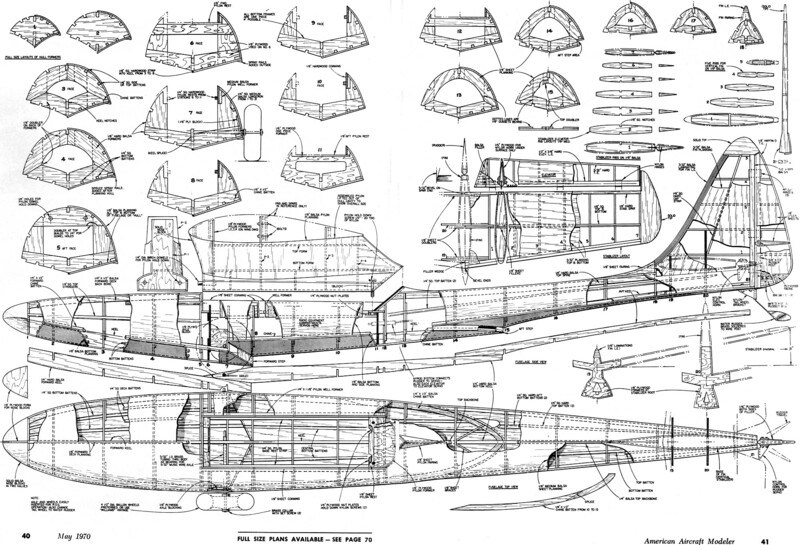 Hull: The performance of a flying boat depends on the design of the hull. 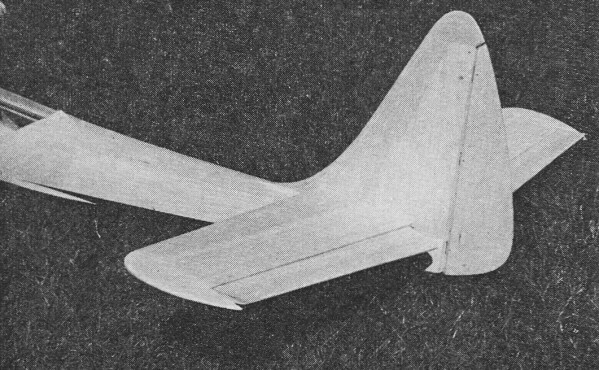 This is the primary difference from a land plane whose fuselage design has relatively less importance - at least i n R/C model planes. Considering lateral stability on the water, takeoff characteristics, parasite drag in the air, and structural weight, a hull with a bottom of relatively large area (instead of a deep hull) and with a sector section (fan-shaped section), was taken as a basic concept. The propriety of this assumption has been well proved since by practical experiments and improvements. The front part of the plane to the step has been improved several times, and now the plane shows very good performances both on the water and in the air. The hull is an orthodox semi-monocoque structure which has a planked shell over a keel, longerons and formers. Waterproofing is the most important process. Before building, all the parts must be dipped in the clear dope, and the same process is required after planking. As to planking a sheet, it is easy to cement one hem and dry it, and then to spray water on the sheet and bend it. Tail: We often see flying boats with their stabs in a high position to avoid water splashes. I adopted this system at first, but soon found that the slipstream pushes the stab upwards and prevents takeoff. I n addition, this system produced some structural weak points. I therefore lowered the stab radically and gave it a small dihedral. Even with this dihedral, water splashes were not completely avoided, but they seemed to do no harm to the takeoff. 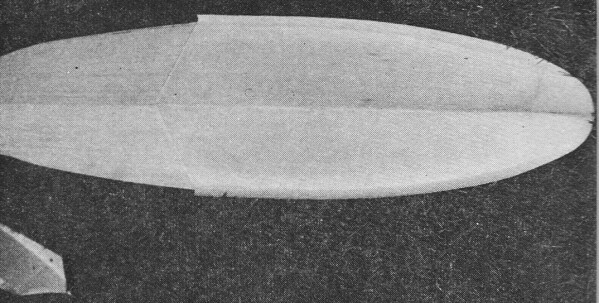 The fin, stab and tail part of the hull are built in one unit. Wing: The airfoil and structure are conventional. 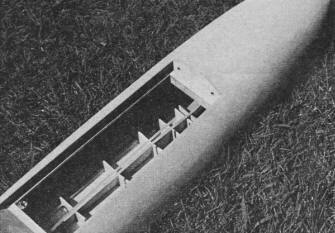 The main spar s positioned a little rearward to install an 8 oz. fuel tank in the wing. It is recommended that hardwood reinforcements be added from the wing root up to he engine mount. Engine mount: In the first prototype the engine position was about 5 cm. more to the outside than on this version. But the engines have been put nearer to the center-line, to be safer in case of the single-engine flight. The cherry-wood mounts are supported by he front and rear spars. 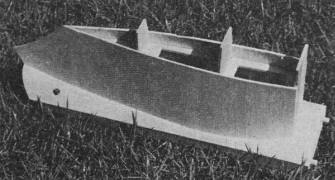 Wing tip floats: These support the plane in a standing state and in initial, slow plowing, adhering to the water surface. But they must clear the water as soon as the plane gains speed, which can stabilize and lift up the hull. The position and the method of the attachment of wing tips are key points. Tip floats fixed too far to the outside harm the longitudinal stability and those fixed too much to the inside don't have the ability to recover from slanting attitude, when one of them dips into the water. Attachment to the wing is the most difficult part. In earlier stages, I screwed them into the hardwood mount in the wing, but they were usually broken when the plane landed in a slanting attitude. As the result of repeated experiments, the material of the stays has been changed from wood to aluminum, and fittings from screws to rubber bands. The shocks are consequently absorbed by both the elasticity of rubber and bending of aluminum. The section and structures are almost the same as the hull. this model flies very well with one big center-mounted 60.